Blood Source Award. Photo By Jeff Rawlinson. 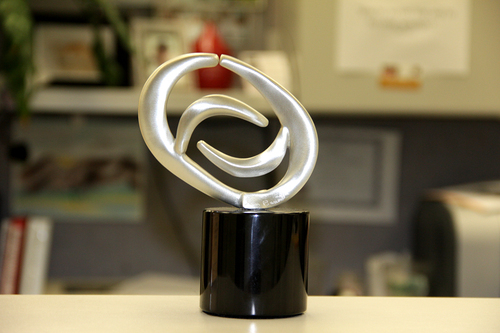 City College was recently awarded the Gift of Hope Award for its accomplishments during the 2011 Blood Source blood drives. According to Brie Leon, Blood Source account manager, City College won the award over 50 other junior colleges, technical schools and universities in the surrounding area including all Sacramento schools that participated in the drives. This is the first time City College has won the award, according to Leon. City College’s Health Services team sends out emails, posts fliers, notifies local businesses and incorporates the blood drive into the campus health fair, said Leon. The Health Services team also reaches out to extension schools to encourage them to have bloods drive of their own, Leon said. “[The City College Health Services team] have been enthusiastic about making the blood drive a priority on campus and we are truly lucky to have their help,” said Leon. City College Health Services assistant Pat Cousin said that the school won the award because of its tremendous efforts to help others. “It’s all because the students and employees are making such an effort toward life saving,” said Cousin. Cousin said she was shocked when the City College was announced as the award recipient at a recent award ceremony. Cousin said the next blood drive dates will be April 25 and 26 during the health fair and that the Health Services team encourages students to give blood. If you are interested in giving blood, visit Blood Source’s official website. This entry was posted in News, Sac City Express (SCC) and tagged award, blood, city, college, donors, gift, health, hope, sacramento, services, source. Bookmark the permalink.